Last week three big brands released innovative Facebook campaigns that demonstrate how traditional brand marketers are moving beyond the Page Like in their advertising efforts on the social network. With these campaigns being developed through their respective ad agencies, it was fitting that STRATA also released their quarterly report last week, showing that 89% of ad agencies use Facebook in their campaigns (a 10% increase from Q2). Toyota has created a branded Facebook arcade-style racing game in anticipation their new sports car model, to be unveiled at the Tokyo Motor Show in December. The App creates a customized course in the shape of your first name, pulling in photos and other profile information to populate billboards alongside the course. Players can “test drive” the new Toyota model, challenging their friends in track times, successfully creating both a personalized and social in-game experience. Players are competing globally in in an effort to be awarded a grand prize trip to Japan or receive an exclusive painting of the car created by the concept car’s designer. 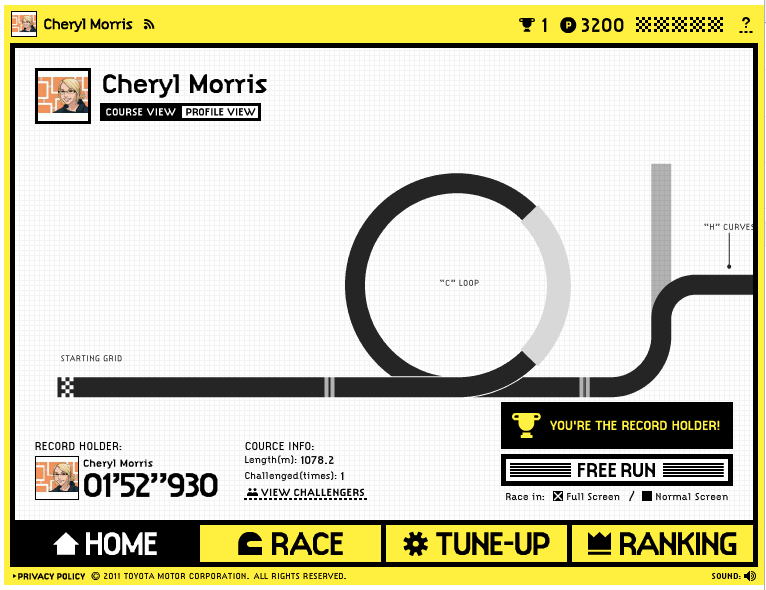 According to Adverblog, Japanese ad agency Party is behind this social game. Known best for its ketchup, Heinz’s latest Facebook campaign underscores how its soup has also been a staple in family cupboards since 1910. 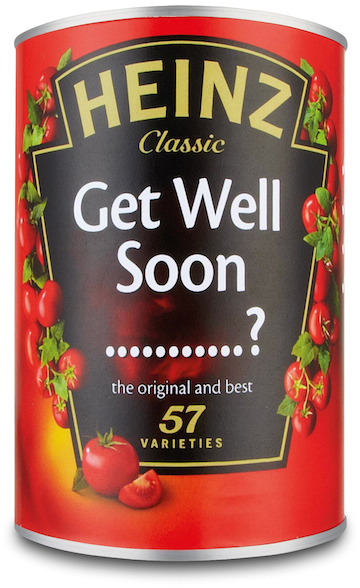 The Heinz ‘Get Well’ Soup campaign allows Facebook users to send a real, personalized can of soup to any of their sick friends. An F-commerce (Facebook commerce) play, upon liking the brand’s Page fans choose a flavor (Cream of Chicken or Cream of Tomato), create a custom get well soon message, and choose the recipient. Heniz prints the message on a customized soup can label and ships it to the recipient for $3 (sent via Paypal). Social Commerce Today notes that Heinz is an F-commerce leader, with agency We Are Social helping the brand launch campaigns in the past such as its social coupons, whereby the value doubled upon sharing. 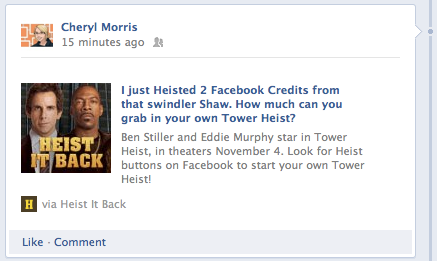 Universal Pictures released a fun Facebook game for its latest movie Tower Heist with Ben Stiller and Eddie Murphy. The Heist It Back game encourages Facebook users to “heist” up to a million free Facebook credits by following a trail around Facebook, doing things such as inviting friends to play, submitting stories, and Liking individual character Pages. The activity is in line with the movie’s plot, whereby the characters fall victim to and then take revenge on a Wall Street executive who enlisted them into a Ponzi scheme. As AdAge remarked, the game could help introduce Facebook credits to a user base beyond social gamers who are not yet familiar with the social currency. The Branding Farm is the agency behind the campaign, built alongside Facebook credits company iFeelGoods. We already know that budgets for these types of social advertising and marketing plays at Fortune 100 companies are going nowhere but up. It’s not hard to envision how these types of branded Apps and commerce plays will expand both in number and complexity as developers begin to take advantage of the new Open Graph features that integrate branded verbs and objects.